SCOTTSDALE, AZ--(Marketwired - Jul 10, 2014) - TASER (NASDAQ: TASR) today announced that the second quarter 2014 earnings call is scheduled for Wednesday, July 30, 2014. A conference call is scheduled at 11:00 a.m. ET to review the second quarter financial results. TASER CEO Rick Smith and CFO Dan Behrendt will host the webcast. To join the live audio presentation, please dial toll free at 877-303-9126, or for international callers, please dial 253-237-1156. The pass code is 70163279. For more information regarding the webcast or conference call, please visit http://investor.taser.com/. Please visit http://investor.taser.com, http://blog.taser.com, www.twitter.com/taser_ir, www.twitter.com/officialtaser and www.facebook.com/TASER.International where TASER discloses information from time to time about the company, its financial information, and its business. TASER protects life: TASER Conducted Electrical Weapons (CEWs) have saved more than 127,500 lives from potential death or serious injury. TASER protects truth: We enable greater transparency with the industry-leading TASER CAM and AXON on-officer video systems. Together with our customers, we are defining the future of smart policing by connecting intelligent devices and sensors with the first secure cloud-based digital evidence management solution for law enforcement: EVIDENCE.com. TASER® is a registered trademark of TASER International, Inc., registered in the U.S. All rights reserved. TASER logo, TASER X26™, TASER X26P™, TASER X2™, TASER CAM™ HD, and AXON flex™ are trademarks of TASER International, Inc.
TASER’s HQ in Scottsdale, AZ. TASER as a technology solutions provider with its TASER Smart Weapons and AXON body-worn law enforcement cameras. 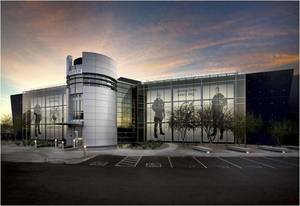 Photo courtesy of TASER International, Scottsdale, Arizona USA.